“Commitment,” a story based on my own fraught attempt at draft resistance during the Vietnam War, was published by the journal “3288 Review” two years ago. After watching most of the recent PBS documentary “The War in Vietnam,” I decided to publish it again on Medium.com. Ken Burns’ 18-hour “The War in Vietnam” was riveting TV, with previously unseen combat footage, a useful overview of American political history during that long and brutalizing war, and a commitment to let American veterans tells their own affecting stories. The show also shorted the stories of the many young American men who chose — like Clinton, Bush, Trump, etc. — to avoid military service by any means available. 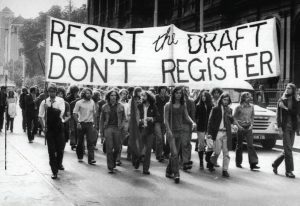 And those of us, also many in number, who chose to confront the issue of whether to resist the war, rather than shelter in the privilege of deferment. I started off on that path, but found it hard to stay the course.